The original medallions were arabic numerals for 3, 6, 9 and 18 months and roman numerals for years. If you want to send in your picture of a 3 or 9 month medallion, that would be great. 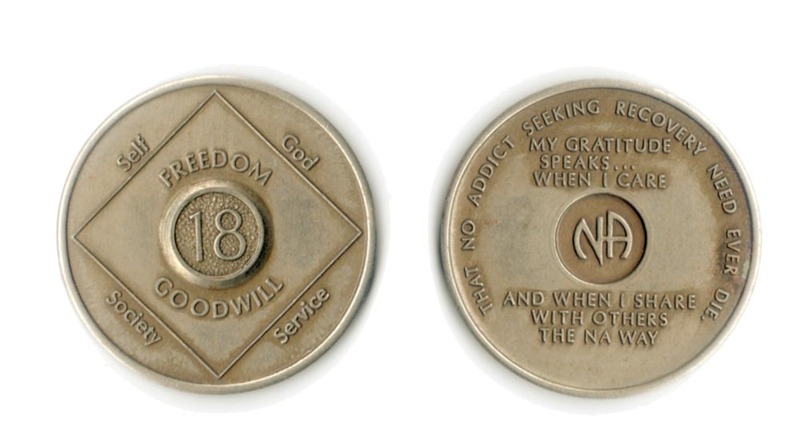 These 3, 6, 9 and 18 month medallions were available to the fellowship in some way, but I am unsure how. 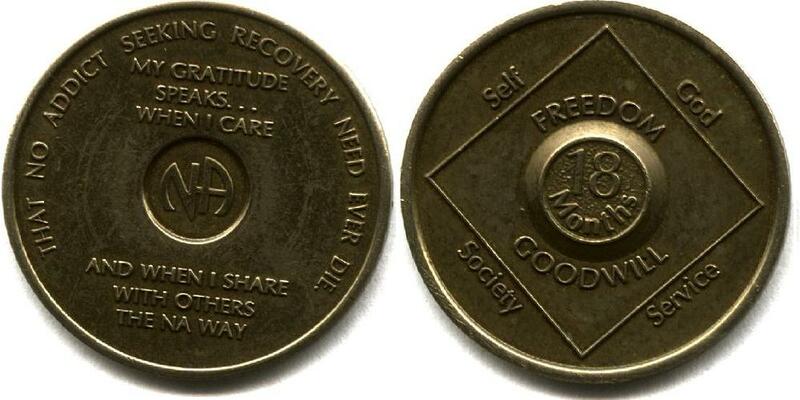 This design was adopted at the 1985 WSC and the member who designed it signed all rights over to Narcotics Anonymous at that time. I believe that the WSO did not ever sell any 3, 6 or 9 month medallions, so I just put this up the front prior to the 1985 set. They later issued an 18 month medallion and that medallion has the word months underneath the 18. The original medallions had roman numerals for years clean. The standard set was 1-20 years. The extended set covered 21 - 40 years. You could "special order" 21-40 years. 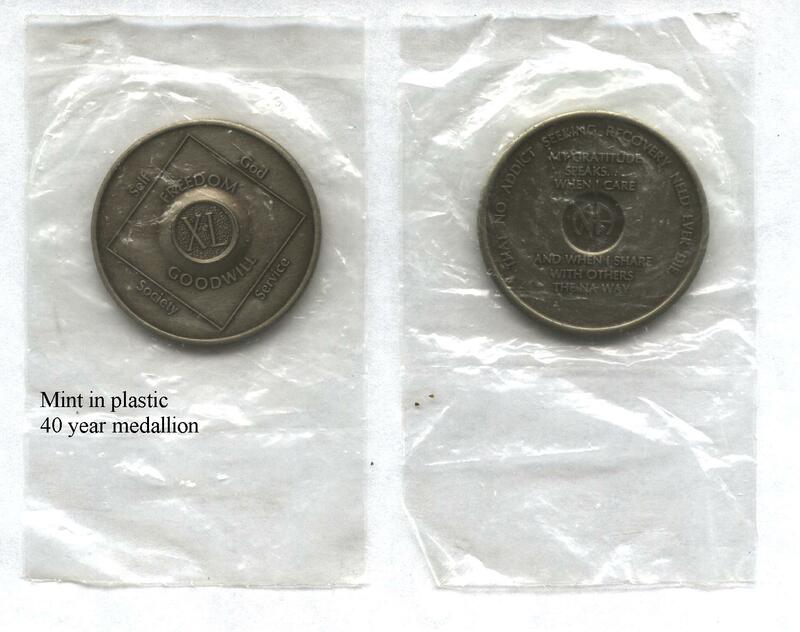 At some point an 18 month medallion was added to the mix, and that was before the 18 month keytag and prior to changing the design with the (c) 1991. I am unsure if the eternity medallion design was issued with the "old school" circle or the (c) 1991 yet still in the antiquated bronze. Design available in standard, later as - silver, & gold-plated. The standard set was 1-20 years. 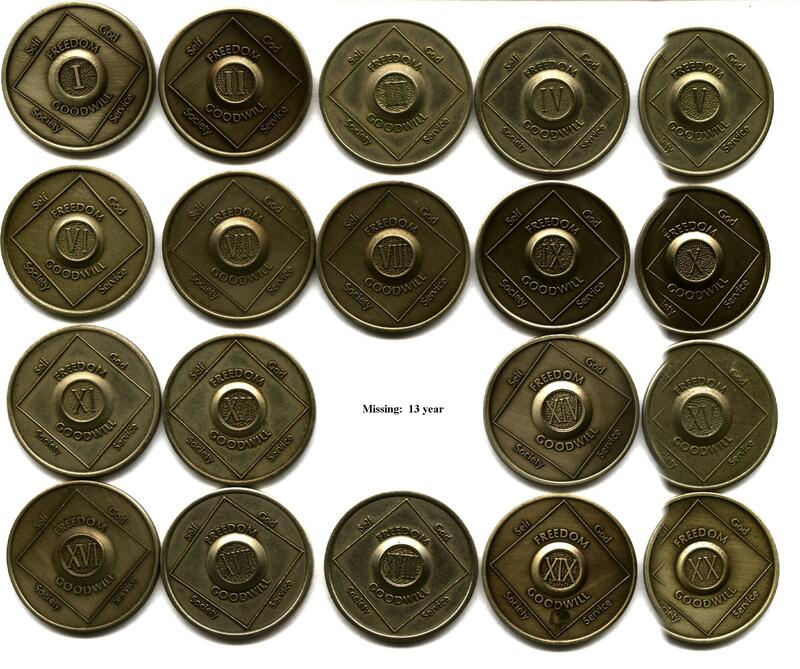 The extended set covered 21 - 45 years, there was an eternity medallion and an 18 month medallion - used arabic numerals. (c) 1991 silver plated zinc medallion. The first time I saw a silver plated zinc medallion was at the 1996 World Convention. 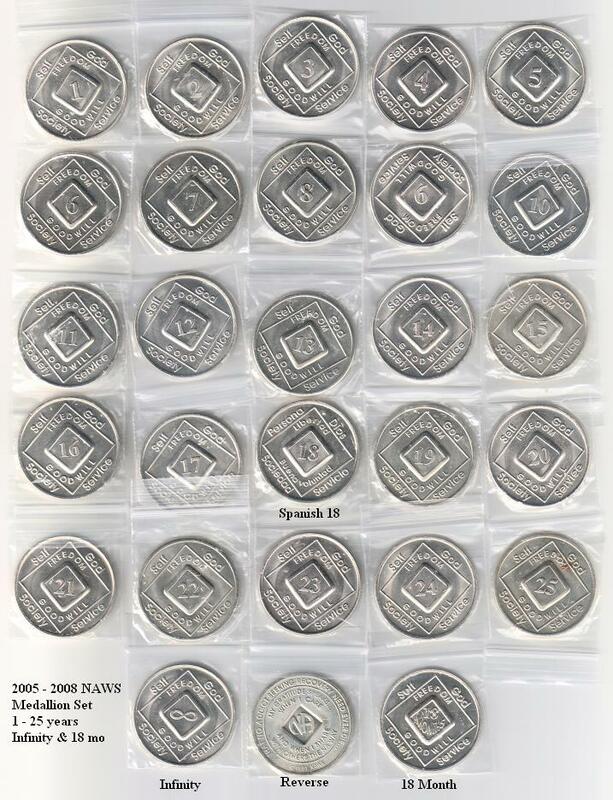 The WSO set up in St Louis at the convention was giving away the eternity medallion in the silver plated zinc, so I list the zinc plated set as being the 1996 set. It may not actually have been available until 1997. Design available in standard, silver, gold-plated and bi-plated and 14 Karot solid gold medallion. Also available in Brazillian/Portuguese, Spanish, French and Hebrew. Brazillian, Spanish and French 1-20 years and 18 months. Hebrew 1-25 years and 18 months. This new set features a new design, using arabic numbers & claiming copyright of 1991 - was it designed then? The standard set is 1-50 years. There is an infinity medallion and an 18 month medallion. (c) 1991 silver plated zinc medallion. This set became available on September 1, 2005 and the old design - no longer available. Design available in standard, silver, gold-plated and bi-plated. There is no 14 Karot solid gold medallion. This new set features a new design, using roman numbers & claiming copyright of 1991 by NAWS - was it designed then? The standard set is 1-50 years. There is an infinity medallion and an 18 month medallion. 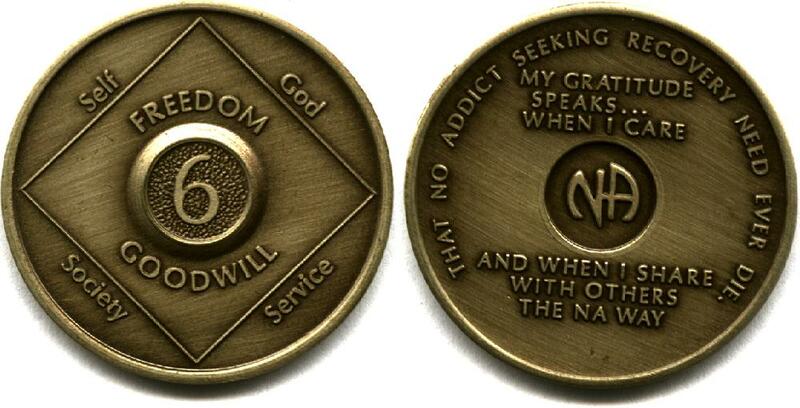 (c) 1991 NAWS ''bronze'' medallion. This set became available on October 1, 2008 and the old design with arabic numbers - no longer available. Design available in standard, silver, and bi-plated. There is no longer a Gold plated medallion.